A famous historic house, a New Orleans mansion, previously the home of author Anne Rice, was for sale. The Brevard House is a particularly fine example of the large, narrow and long, two-story residences built in the Garden District in the prosperous decade that preceded the Civil War. A mix of Italianate and Greek Revival, with Ionic columns on the first floor and Corinthian columns on the second. The First Street facade has a tetrastyle, two-level entry porch with four square end columns, four round columns, and ornamental iron grillwork. The two centrally located round columns of the first level are of the Ionic order, and those of the upper level are of the Corinthian order. A small, two-level, wrought-iron porch on the Chestnut Street side leads into the "hexagonal" library wing. This porch and a larger, two-level porch on the southeast garden side of the main block are both fairly typical of the wrought-iron porches added to New Orleans domestic structures in the mid-nineteenth century. The two level galleries on the southeast garden side of the two-part rear wing are of wooden construction and are less elaborate than the porches visible from the street. One of the world's most dazzling residential neighborhoods – containing a time capsule of historic southern mansions – is located in the Louisiana city of New Orleans. The Garden District, a large square area bounded by Jackson Avenue, Louisiana Avenue, Magazine St. and St. Charles Ave, is the live oak tree-lined "American" sector of this southern city. For the most part, Americans who settled in the Garden District during the nineteenth century shunned local Creole influence. They were more interested in something more permanent that clearly showed their wealth and taste. The architecture of these historic houses is a fusion of classic styles with influence of Spanish, French, Italianate and English, as well as Greek Revival. These stately homes represent some of the best work of some of the leading architects and builders of the 1800s. Today a stately Garden District mansion is on the market for nearly for $4.5 million. 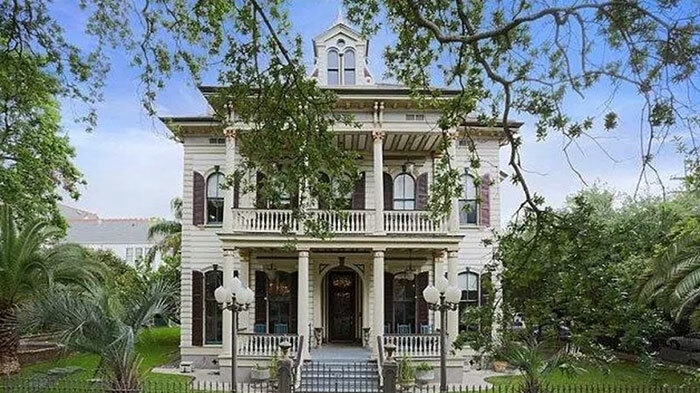 This historic house, located at 1239 First Street, was previously owned by author Anne Rice and is the setting for her novel, The Witching Hour. In the story, the historic house was the ancestral home for the Mayfair family and their generations of male and female witches. 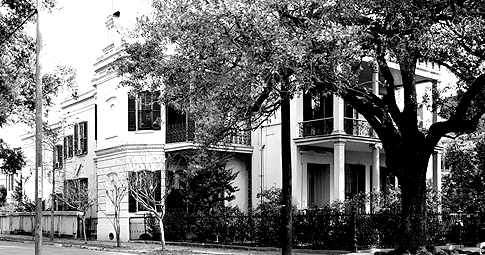 The mansion, originally known as the Brevard House, is a particularly fine example of the large, narrow and long, two story residences built in the Garden District in the prosperous decade that preceded the Civil War. The 1850s Greek Revival style residence boasts nearly 9,000 square feet on three floors with five bedrooms and six full baths. 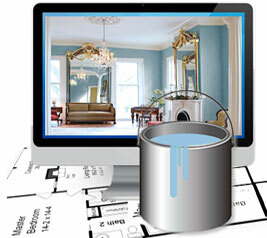 The home features period touches such as murals in the dining room, ornate millwork and beveled mirrors. It also has a large, heated salt-water pool, fish pond, guest house, staff house and "lush grounds with maintained gardens." There are five bedrooms, six full baths and two half-bath. In 1852, Albert Brevard purchased the property; in 1857 he commissioned architect James Calrow and builder Charles Pride to construct the stately two story brick building. Brevard died within two years and the mansion was inherited by his daughter, Elizabeth Brevard Woods. The First Street façade has a tetrastyle, two-level entry porch with four square end columns, four round columns, and ornamental iron grillwork. The two centrally located round columns of the first level are of the Ionic order, and those of the upper level are of the Corinthian order. A small, two-level, wrought-iron porch on the Chestnut Street side leads into the “hexagonal” library wing. This porch and a larger, two-level porch on the southeast garden side of the main block are both fairly typical of the wrought-iron porches added to new Orleans domestic structures in the mid-nineteenth century. 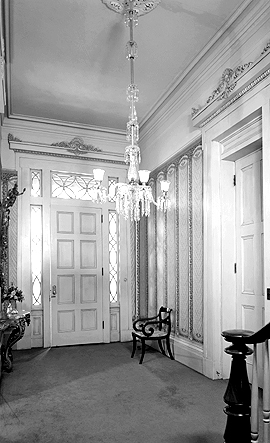 The prominent doors and doorways of the first floor main entry hall all have Greek Revival narrow moldings and low pediments with decorative scrollwork. 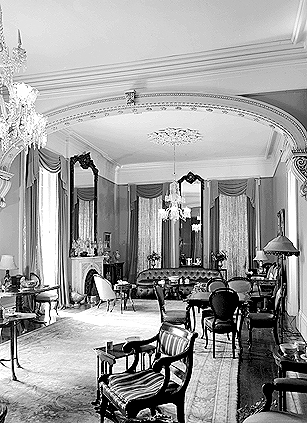 Moreover, each of the major rooms of the first floor has a wide, elaborate molded cornice and a large decorative plaster medallion in the middle of the ceiling. One of the most notable decorative features of the Brevard House is the flattened elliptical archway that separates the double parlors. The moldings, rosettes, and supporting scroll-brackets are all fine examples of the decorative trimmings of the Greek Revival at the mid-nineteenth century. 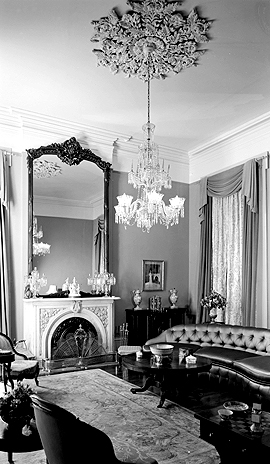 Detail of the first floor parlor fireplace topped with a custom-fit beveled mirror. Note the decorative plaster medallion in the middle of the ceiling. 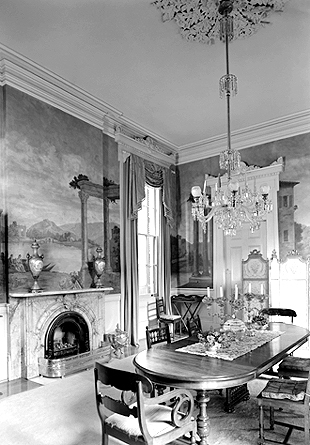 The first floor dining room is decorated with wall murals.